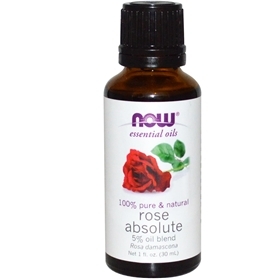 NOW Rose Absolute Oil - 1 oz. NOW Rose Absolute Oil is a luxurious blend of 5% essential Rose oil set in a prediluted base of natural, odorless Grapeseed Oil. As one of today's most highly adorned extracts, essential rose oils can recall feelings of romance, unity, compassion and purity in ways that no others can. NOW Rose Absolute Oil is a blend of 100% natural ingredients and is gently extracted from the flower's delicate head. Suggested Use: The blend is already prediluted and ready for aromatherapy use. Please consult an essential oil book or other professional reference source for suggested uses.